At least 178 tornadoes raked through 14 states on April 27th and 28th, making it the largest tornado outbreak in U.S. history, said the National Weather Service. For those who have lost their homes and have damaged property, you are not alone. We can all empathize with the destruction you have faced. 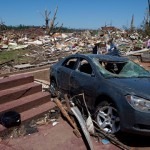 Unfortunately, many of those victimized by the tornadoes had little or no insurance. Worth Ave. Group does provide protection for all natural disasters including flood, hurricane, tornado and lightning strikes. We have had many claims pouring in from our customers in the areas devastated by the tornadoes. These people are lucky. They had protection when they needed it most. Will you?